If you were a kid growing up in the 1970s, you probably remember that the commercials were often as entertaining as the TV series. Remember the ads for products like Lite Brite, McDonald’s hamburgers, Battleship, Tootsie Pops, and Etch A Sketch? How about that old public service announcement with the characters from the 1966 Batman TV show? It’s an unusual commercial, if for no other reason than because it marked the last time that actress Yvonne Craig would play the red-haired superheroine, Batgirl. In 1966, the Batman craze was sweeping the nation. 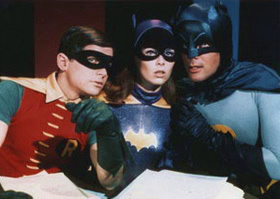 With Adam West as Batman and Burt Ward as Robin, the campy television show got huge ratings right from the start. The ABC series aired twice a week, with a suspenseful cliffhanger ensuring that viewers would return to see the next episode. Children loved the action and colors while adults enjoyed the clever underlying satire and double entendre. By the end of season two, the fad was fading fast. Batman was barely renewed for a third year but was cut to one self-contained episode per week, eliminating the cliffhangers. The character of Batgirl (Craig) was introduced to try to boost ratings but viewers had already tired of the craze. The series’ last original installment, episode 120, aired on March 14, 1968. But, that wasn’t the last time we’d see the caped crusaders. In 1972, the superheroes returned in a unique way. They appeared in a public service announcement (PSA) for U.S. Department of Labor that was aimed at educating viewers about the “Equal Pay for Equal Work” campaign. The Federal Equal Pay Act of 1963 made it illegal for employers to pay men or women different wages if they performed jobs that required equal skill, effort, and responsibility. Though the legislation was passed almost 10 years earlier, many employers still weren’t following it. Should Craig be offered a cameo in the next Batman movie? The Batman spot was shot in a similar format style to the show and William Dozier, the Batman TV show’s creator and narrator, returned to do the voice-over. Ward and Craig reprised their roles as well but it wasn’t West beneath the cowl. At the time, West was trying to distance himself from the role and opted to pass. He later made peace with his typecasting and West reprised the role for public appearances, in two live-action specials and numerous cartoons. Costume trouble aside, the PSA was an enjoyable experience for Craig. She concludes, “The shoot took place three years after the series had ended and, yes, [it] was my final appearance as Batgirl. Fun times.” Stay tuned! The funny thing about that PSA [maybe it qualifies as irony] is that in season 3, Yvonne Craig was making $1050 more per episode than Burt Ward, according to records kept by Dozier. That would be $7000 more today. Royalities? To whom, the estates of its Creator Bob Kane? Royalities to those deceased actors and actresses that appeared on the show? Royalities to FOX? Royalities to whom? It is absurb! After all, it should be made aware that most of those people that have since passed,and 7 years after the fact, too. But then again it could be families asking for loyalites for having the deceased relatives face or likeness appear on any dvd cover or disc. Jeaze, who would have thought. Where is the loyalty to the fans? Huh? Batman still remains my absolute favorite television show and it is such a shame that due to legalities it has not been released on DVD/Blu Ray. Yvonne is an amazing woman and I am so happy to say that I have been extremely fortunate that she has come into my life. Both her and her sister are like family to us now. Together, those two could save the world! !